Seanbaby's Review of Where's Waldo? 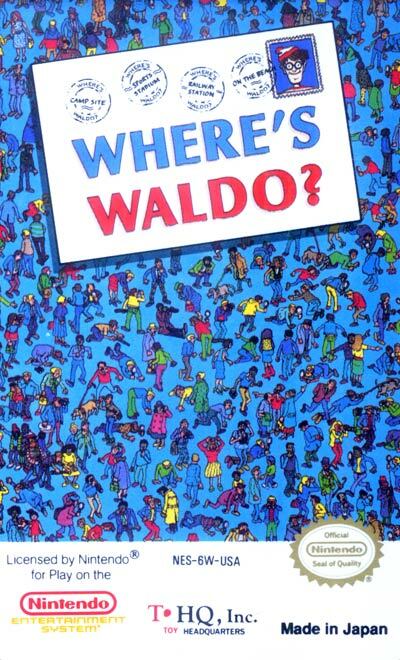 Where's Waldo was the first Waldo video game. The product was loosely based on the book Where's Waldo. The player's goal is to find Waldo in various pictures in order to progress through the game. The pictures are still images the size of the screen in the "Easy" and "Practice" levels. In the "Medium" and "Hard" levels, the player has to scroll to the side to see the rest more of the area. The directional buttons control a magnifying glass and that must be placed over Waldo in order to "find" him and move to the next level and a new picture. In the Practice level, there is no time limit, however only a select number of levels are open (the Train Station, Forest and Caves). The time limit for the other levels varies: Easy=959, Medium=659, Hard=459. Each time the game is played Waldo is moved to a new location in the scene.